VACAVILLE, Calif. /California Newswire/ — Integrated Comfort, Inc. (ICI) has completed DualCool installations on 12 more Walmart Stores (NYSE:WMT) in Northern and Central California. DualCool is a retrofittable system that significantly improves the efficiency of rooftop cooling units (RTU's) in dry climates. ICI's patented DualCool technology uses a direct evaporative process to increase compressor efficiency, and an indirect process (no moisture added) to pre-cool ventilation air. On retail facilities in hot dry climates, DualCool can reduce annual cooling energy use and peak electrical demand by 25 to 40 percent. The 2012 Walmart DualCool program follows the 14-store 2011 program developed as a partnering effort of three affiliate members of the UC Davis Western Cooling Efficiency Center (WCEC): Pacific Gas and Electric Company (PG&E), Walmart and ICI. UC Davis launched the WCEC in 2007 to accelerate the implementation of proven cooling technologies that take advantage of the unique characteristics of dry climates typical of the western U.S.
"We are focused on leading the industry with implementation of cost-effective technologies that improve efficiency and move us toward a more sustainable future," says Jim McClendon, Walmart Director of Engineering. "We have been evaluating various evaporative pre-cooling products, and our major criteria are performance, durability, and favorable economics." 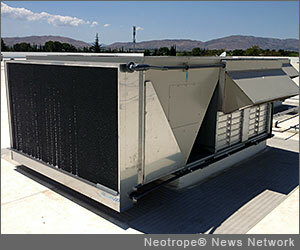 Walmart began testing DualCool on stores in California and Arizona in 2008. ICI introduced its "Generation 2" DualCool version in 2010. Prototypes of this higher-performance, lower-priced DualCool line have been monitored by the WCEC since 2011. The performance of the installations has encouraged PG&E to provide partial funding of the installations through its Emerging Technologies program. "We are always interested in technology that allows our customers to save energy during peak hours of operation," said Dave Alexander of PG&E. "Thanks in part to the work of the Western Cooling Efficiency Center and their affiliate partners such as Wal-Mart and Integrated Comfort, there is a renewed interest in evaporative pre-cooling for hot dry climates. Our detailed monitoring through the 2012 season indicates that these systems are performing in accordance with our expectations." The 213 DualCool units in the 2011/2012 projects serve stores extending from Oroville in the north to Dinuba in the south. Mark Modera, Director of the WCEC, comments that "Retrofit cooling efficiency technologies are particularly needed because there are millions of rooftop units (RTU's) in use that will not be replaced for years. The WCEC is encouraging both new and retrofit cooling technologies, but the achievable savings potential over the next ten years is greater in the retrofit category." "DualCool is designed for durability and easy service," notes Steve Short, ICI General Manager. "Our stainless steel enclosures, top-of-the line evaporative media, and high-performance cooling coils ensure long life, large peak demand reduction, and significant energy cost savings. We look forward to more partnering with key organizations to cost-effectively improve the efficiencies of commercial cooling equipment." Integrated Comfort, Inc. is a privately-held California corporation that develops and markets energy-efficient cooling products and systems. Learn more at: http://www.icidualcool.com/ .